An artist whose vision deteriorated after lens replacement surgery is one of dozens of people considering legal action against manufacturer, Oculentis. Denise Di Battista claims she has “blind patches” in her right eye. 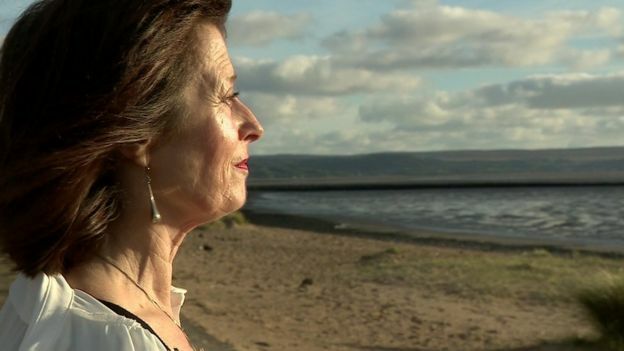 The BBC has been told that there have been 800 cases of patients in the UK experiencing “opacification” of a particular implanted Oculentis lens. “If I was looking through my right eye, I would think I was almost blind…. It affects my painting and that depresses me terribly,” she told the BBC. Denise does not have a problem with black-and-white contrast but she does with colours, tones and low light. 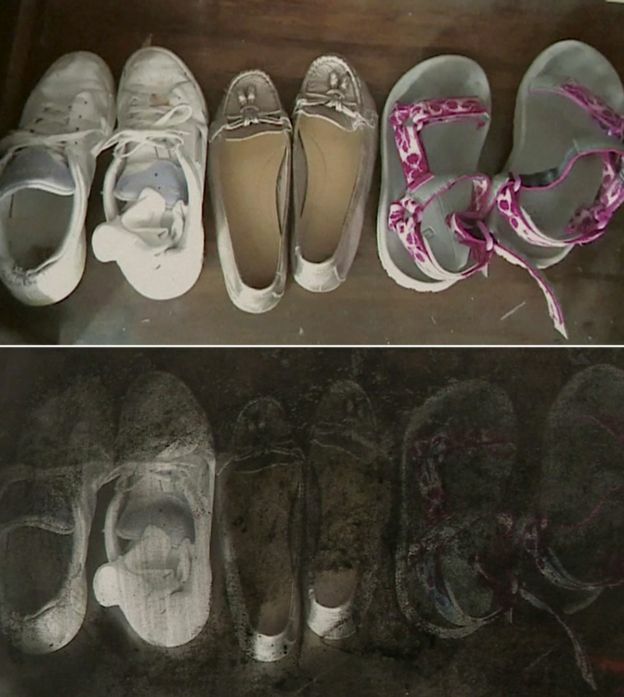 She says the picture of the shoes below represents what she can see in low light with her “good” left eye. The second image represents the level of vision in her affected right eye. Denise says she was devastated when she learned the problem was possibly caused by an issue with the lens. The lenses Denise received were made by European manufacturer Oculentis. Reports began to emerge that a small number of patients who had received a particular lens were experiencing what is known as opacification, a cloudiness in their vision, caused by calcium deposits. Oculentis investigated and identified the problem as possibly being the result of an interaction between phosphate crystals used in the hydration process and silicone residues on the lens. The company says there is evidence some people may be predisposed to this problem or that certain medication can be a factor. Oculentis decided to advise providers to return affected batches of the type of lens Denise had been given. There is no suggestion that any Oculentis lenses currently available are affected. 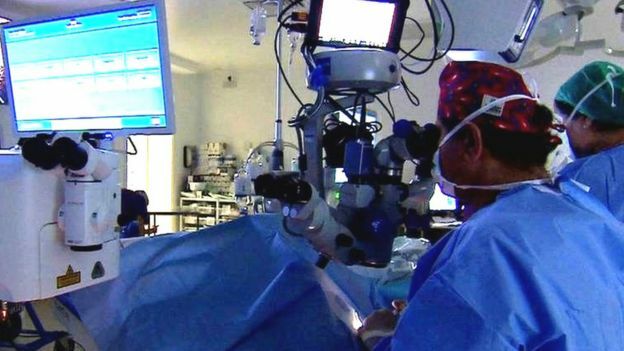 Leading eye surgeon Sheraz Daya, who has tried to help patients like Denise, told the BBC: “A percentage of lenses have deposits of calcium on the surface that only become evident five to seven years later, when they accumulate enough to obscure their vision. Oculentis says the only way to correct the problem is to replace the lenses and has paid for surgeons like Sheraz Daya to do this. Thus far about half of those affected have had their lenses replaced. Around half a million people have cataract surgery each year, making it the most commonly performed operation in the UK. There are an estimated 800 cases from the affected batches of Oculentis lenses which have led to problems with opacification, a very small proportion of the total. In a statement, Oculentis told the BBC: “We regret if any patients have experienced complications following the implant of one of our lenses. “Opacification, or clouding of the lens, is a known risk of lens eye surgery and can be caused by a number of factors interacting, which are not necessarily attributable to the lens itself. “The incidence rate is extremely low. It can be effectively remedied through lens exchange surgery, which is a safe and well-established procedure. Denise Di Battista’s lawyer, Peter Todd, a partner at Hodge, Jones & Allen, said: “Mrs Di Battista has been left devastated by the deterioration in her sight since she had the Oculentis lens implanted. The BBC has learnt that another law firm Devonshires also has dozens of similar cases. Denise De Battista is nervous about having her lens replaced as the procedure is not routine and not all eye surgeons are prepared to do it. So, for the time being, the land and seascapes that she loves and paints remain clouded and obscured.